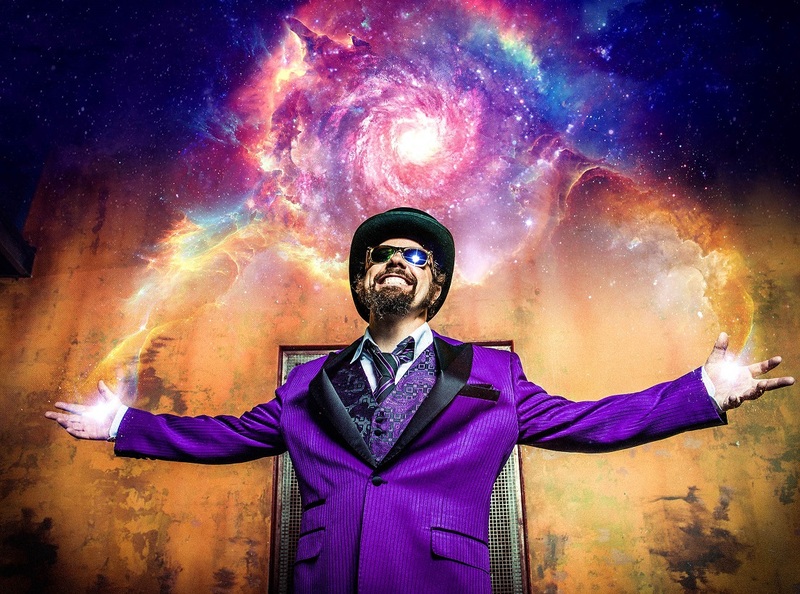 Secret Agent 23 Skidoo is a Grammy winning, internationally touring, purple velvet tuxedo wearing family funk phenomenon. Combining the positive, primal power of hip hop with the surreal storytelling of science fiction, 23 Skidoo has concocted a potent potion that wows family crowds across the planet. The ingredients of his magic spells include reverence for the boundless mind states of young children, respect for the culture and DNA of hip hop, funk and soul music, and a deep belief in the power of the imagination to change the world in positive ways, both personal and universal. 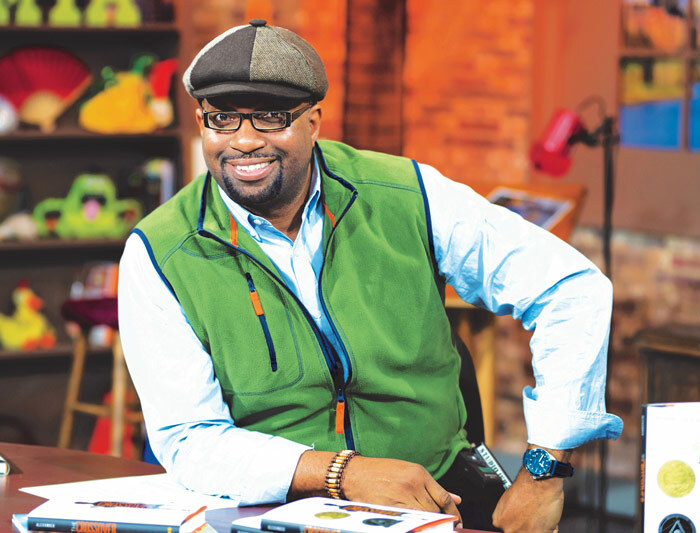 Kwame Alexander, 2017 National Summer Reading Champion, is a poet, educator, and New York Times Bestselling author of 21 books, including BOOKED and THE CROSSOVER, which received the 2015 John Newbery Medal for the Most Distinguished Contribution to American literature for Children, the Coretta Scott King Author Award Honor, The NCTE Charlotte Huck Honor, the Lee Bennett Hopkins Poetry Award, and the Paterson Poetry Prize. Kwame writes for children of all ages. His other works include SURF’S UP, a picture book, and HE SAID SHE SAID, a YA novel. A regular speaker at schools and conferences, he travels the world planting seeds of literary love (Singapore, Brazil, Italy, France, Shanghai, etc.). Each year, Alexander leads a delegation of writers, educators, and activists to Ghana, as part of LEAP for Ghana, an International literacy program he co-founded that builds libraries and provides literacy professional development for teachers. When I was a kid, I lived in a small town in central Florida called Clermont. I loved all of Clermont: I loved the lakes and the hills and the small downtown. But my very favorite thing about Clermont was Cooper Memorial Library. It was an old house filled with books, and one of the librarians there, Miss Alice said to me one day that I was a “True Reader,” and because of that there was no limit on the number of books that I could check out and take home. That library was a magical place for me – a place of possibility, safety, and promise. My greatest hope is that each of you has the chance to feel the same way about your own library. This summer, public libraries around the country are offering summer reading programs. If you haven’t signed up yet, stop by your local library and put your name down. There will be games and prizes and all sorts of activities, but most of all, there will be stories – more stories than you can possibly imagine. The theme this summer is “On Your Mark, Get Set, Read!” At the library you can find books that will encourage you to stay active in the world. And getting there can be an activity, too. I used to ride my bike to the public library in the summertime. Find ways to challenge yourself and set goals at your local library. So sign up for the summer reading program and discover the magic of your own library. Through stories, you can enter a new world and connect with others in your school, in your family, and across the country who are also reading. And when someone asks you what you did with your summer, you can proudly show them your reading log and tell them all about the great stories you experienced and all the heroes you met. 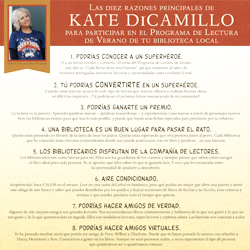 Check out Kate DiCamillo’s Top 10 Reasons to read this summer! To download the 8 x 11 flyer please click on the image. 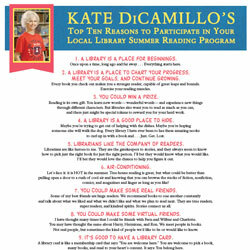 Check out Kate DiCamillo’s Top 10 Reasons to read this summer! To download the 11 x 17 flyer please click on the image. 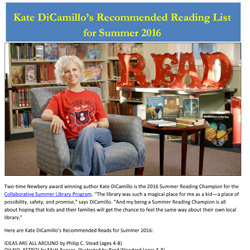 Check out Kate DiCamillo’s Recommended Reading List for Summer 2016! To Download the 8 x 11 flyer please click on the image. To download the SPANISH 8 x 11 flyer please click on the image below. To download the SPANISH 11 x 17 flyer please click on the image below.